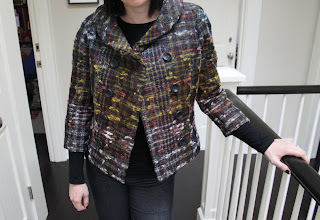 I finished this jacket during my recent sewing retreat, except for the last few buttons which I was just too tired to do then. This past weekend I added those, stitched in my label, and voila, it's done. As described before, the fabric is wool and organza by Carolina Herrera. The pattern calls for 1 and 5/8 yards of 60" fabric, but I purchased 2 yards so I could match the plaid at the seams, and I needed every inch of that 2 yards to successfully do that! The lining is Bemberg rayon. The interfacing is Pro-Weft fusible from Sew Exciting. 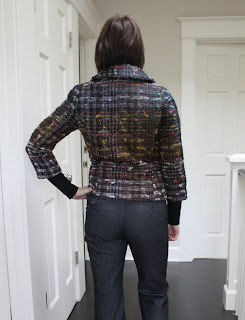 I considered lengthening the sleeves on this jacket but in the end decided against it. I actually don't own any 3/4 sleeve jackets yet so I figured I'd see what they're all about. This jacket pattern does not include pockets, and I forgot to add them. Just something to consider for others who want to make this up. 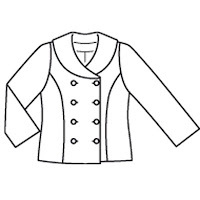 I bagged the lining, using the instructions in Cecelia Podolak's Easy Guide to Sewing Jackets, like I usually do. I don't know what I would do without that book! I briefly considered bound buttonholes but since my machine buttonhole sample turned out so nice, I went with those instead. I think this would be great in a solid color with a matching skirt to wear as a skirt suit, as suggested in the magazine. The shawl collar didn't turn out as large as I was expecting, perhaps it's because of how my thick fabric affects the turn of the cloth. If I were to make this again (which I would most certainly consider), I might redraft the shawl collar to be a bit wider. I don't think this is a jacket that I'll wear often, the fabric is a little too delicate for that, but with the right outfit and in the right weather conditions, it'll be just the thing. I think it's very pretty! -- and thank you so much for making this up in a patterned fabric: I've got a wool blend boucle all prepped for cutting this jacket; and it's so good to see a bit more what it might look like made up. I like it, too. Sorry you don't love this jacket. But maybe it grows on you with time! It's so cute! You have the best wardrobe! 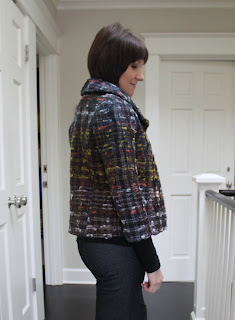 Great looking jacket - I love the fabric! I think it is fabulous. It took me a while to try a 3/4 sleeve jacket. Now I wonder what took me so long. Beautiful jacket, what a great fabric and it fits you perfectly. I love it, particularly the length and the neckline. Looks great with the jeans. You did a fantastic job lining up the color way of this fabric. And I think it's really cute! Your jacket is wonderful and looks great on you. I really like your jacket -- it looks great with the long black sweater underneath -- from here it looks like there are attached knitting sleeves. Gorgeous - great pairing of fabric and pattern. 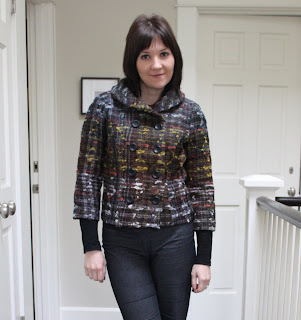 I am planning to make the same one in faux fur, it's fun to see yours in boucle. The fabric is gorgeous, as is the jacket. It almost makes me reconsider my fabric choice! It looks so cute on you and I love the colors in the fabric. You did a great job! Thanks for letting us follow along. Oh that is such a gorgeous jacket! I love how you placed the yellow part of the plaid, the buttons, everything really! I think it looks amazing! I love the shape, and it fits you perfectly. Well done! That jacket is so gorgeous and I love the 3/4 length sleeves. When I saw this one in the magazine I really liked it - now I've seen yours I think I have to make it! Cute jacket! I love the fabric! Wow! Fantastic fabric. I've been following along and the finished product is just great. It looks fabulous! I think you'll actually be reaching for this jacket more than you expect as it kinda goes with everything. Wow, what a great job you did. This fabric turns out the jacket to a really classy and elegant key piece! That is really some beautiful work! I think it looks fabulous! Good job! I've been obsessed with CH since I saw Anna Wintour's dresses and coats in The September Issue. It's gorgeous! You chose the perfect pattern to show off the amazing fabric. Like all your other creations, it's a winner! Wow, great jacket. Love the fabric. Must put this on my "maybe one day" list. jeez am I late to the game! 41 comments! that lining is fabulous. Such a good eye you have girl for fabric to fashion. I love this jacket. I was going through my stash today, looking for something else, and found a couple of pieces of boucle that will be perfect: and, I have the magazine. There you go. It's exquisite! You did an amazing job and it looks great on you. It's a wonderful jacket and it looks very lovely on you! Fantastic jacket! I love the fabric but I love more how you have lined up the colourway. Gorgeous! I'd steal this in a minute. From the Burda picture and the line drawing I thought it would be much wider; now I'm seriously contemplating that pattern! Stunning. I am actually jealous and that's not becoming, but true! Simply beautiful. Wow, this came out lovely! I am so impressed with your plaid matching and the way the sleeves blend perfectly. Love the jacket, and I love the fabric. It's really lovely on you. Gorgeous jacket! Wonderful contruction and beautiful fabric! Oh, that is just STUNNING! You did an absolutely wonderful job! And I agree with your decision to leave the sleeves short. It does make it a different look, more playful and special. Good work! Amazing. I love it. Your touches really make this jacket outstanding. Looks very confortable. I love the fabric!! !